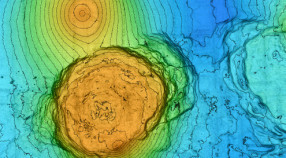 Submarine canyons are considered to be a major conduit for sediment transport from the continent into the deep sea. 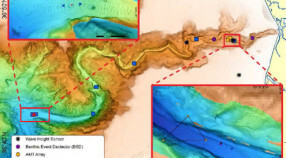 However, little is known about the transport processes that occur within canyons and the rate in which sediments are transported down canyons. 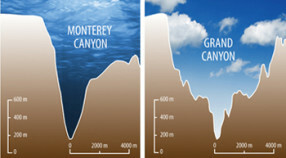 The canyon processes group at MBARI is interested in determining processes by which submarine canyons are excavated. We have begun to systematically characterize the sedimentary materials that move along the floor of the canyon system from their continental source to their final destination on the abyssal plane of the Pacific Ocean. 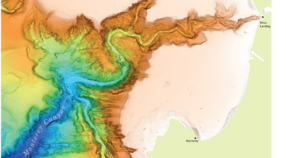 As part of MBARI’s initiative to develop ocean observatories, efforts are underway at MBARI to systematically study the ongoing dynamics in the axis of Monterey Canyon. Under the direction of Charlie Paull we have begun to study the canyon using multiple techniques that provide data similar to the data that are used to understand the dynamic processes in terrestrial river channels. These techniques include: monitoring the physical conditions within the channel by placing moorings on the channel floor, conducting detailed sampling of the channel floor using vibracoring systems deployed from our ROVs, repeat multi-beam mapping of sections of the canyon floor to monitor the changes in the canyons bed that occur in response to physical events, and conducting event response cruises to characterize active sediment transport events.